When two parallel lines are intersected by another line, it creates various angles at the point of intersection. The intersecting line is called transversal. In the above figure, line XY is the Transversal. Vertical Angles are formed when two intersecting lines forms adjacent angles that are supplementary to each other. The two intersecting lines also form pairs of congruent angles called vertical angles. In the above figure the vertical angles are a and b, c and d, e and f, g and h.
Adjacent angles are the ones with a common vertex and common arms. The other angle lying opposite to the common arm is called the adjacent angle. The word adjacent means “next to”. 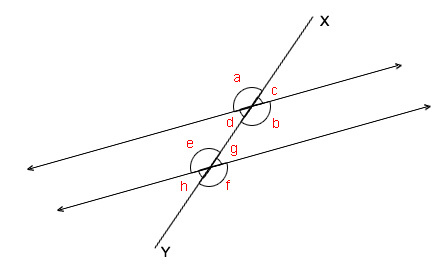 In the above figure, the adjacent angles are a and c, b and d, e and g, h and f.
There may be two different angles formed side by side but they are not adjacent angle if they don’t share a common vertex and ray. In the above figure, a is not adjacent to b but q is adjacent to r . The two angles q and r share a common vertex or a ray, whereas a and b doesnâ€™t share any common vertex or ray. Vertical angles are pairs of angles formed by two intersecting lines but they are not adjacent angles, they are opposite angles. Vertical angles or vertically opposite angles are always equal. In the above figure x and y are vertical angles, whereas q and r are also vertical angles to each other. The transversal, which cuts the two parallel lines, makes eight angles in four corresponding pairs. The corresponding angles in the above figure are e and x, h and z, g and w, f and y. The corresponding angles are always equal. When a transversal cuts two parallel lines, the pair of angles formed on the opposite sides and opposite ends of a transversal are called Alternate Angles. The Alternate Angles in the above figure are h and w, f and x. Alternate angles would always be equal. Test your knowledge – try our Angles and Intersecting Lines Test.